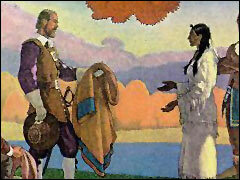 Literature Related to Indians in "Main Street"
Fiction Related to Indians in "Main Street"
Non-fiction Related to Indians in "Main Street"
William Wood's description of Salem (Naumkeag), c. 1629 from his famous account, New England's Prospect, 1634 (courtesy of University of Massachusetts Press) Wood probably lived at Naumkeag between 1629 and 1630 before the arrival of the Winthrop fleet greatly expanded the colony's population and prompted the founding of other settlements around Massachusetts Bay. Excerpt on Indians from New England's Prospect by William Wood (courtesy of University of Massachusetts Press) In this excerpt Wood describes New England Indians, c. 1629-30. John Winthrop's Arrival at Salem. "Fall and Winter, 1716-17," the Great Snowstorm Story. Text of John Greenleaf Whittier (1807-1892) From Legends of New England (1831) "The Indian's Tale"
Text of John Greenleaf Whittier (1807-1892) From Legends of New England (1831) "Metacom"
Text of "Lovewell's Fight," Anonymous Captain John Lovewell (some spell it Lovell) was a well-known Indian fighter and the leader of a company of men who attacked Indian villages along the New England frontier. Lovewell was killed and most of his men shot down during an ambush while raiding the Piggwackett Indians on May 8th, 1725. Lovewell's defeat became the subject of narratives, sermons, and a popular ballad. "Lovewell's Fight" was written shortly after the Battle of May 8th. Capt. Lovewell lived at Dunstable, now part of Nashua, New Hampshire, and it was here that Hannah Duston, Mary Neff, and Samuel Lenorson spent their first night after escaping from Contoocook Island on March 30, 1697. Hawthorne, in 1832, used Lovewell's Fight in his story "Roger Malvin's Burial." The characters, Reuben Bourne and Roger Malvin, are both wounded in the famous fight. Malvin dies from his wounds and remains unburied by the younger Bourne, who is left haunted and guilt-ridden. This selection from The American Magazine of Useful and Entertaining Knowledge seems to be a source and a forestudy for the idea underlying Hawthorne's "Main Street" (1849). In this selection from The American Magazine of Useful and Entertaining Knowledge, Hawthorne write about the superstition of the martyr's path. In this excerpt from James R. Mellow's Nathaniel Hawthorne in His Times, Hawthorne, while on a trip along the Erie Canal, reveals his awareness of the effects of expansion and progress on the Indians and the landscape. “Such Was the Tumultation These Women Made”: The Women of Marblehead Wreak Revenge Upon Indian Captors, 1677 by Robert Roules of Marblehead.